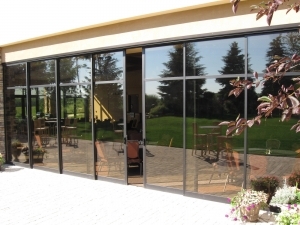 Manual and automatic sliding glass doors / folding doors are ideal for many special applications where swing doors just won’t work. Sliding doors are commonly used in health care, retail or office applications. Folding doors are popular for retail and restaurants that want the flexibility and ambiance of having an open air experince. From standard sliding door designs to customized folding doors, we can design fabricate and install the best available commercial sliding glass door system to meet security, privacy and functionality that is needed. Give our staff the desired function and let us do the rest.